You're all invited to a Linky Party celebrating what's in season. To start things off, I wanted to share what I bought at my local mega-mart in Central Israel last week. Mango, mini pears, & avocado. Green lemon from our tree. This dish was inspired by Penniless Parenting's "Watermelon Rind Salad (Moroccan Inspired)." Penniless Parenting's adventures in extreme frugality lead to lots of interesting recipes, like "Banana Peel Chutney." Her "Zero Food Waste Challenge" goes way beyond composting to "Eating Food Scraps" my wasteful American tastes have trouble comprehending. Check it out for things you never knew you could eat and other money saving tips. Start with 1/2 a medium-large watermelon, after the insides have been eaten or frozen. Slice the rind into manageable slices about 1.5 inches wide. 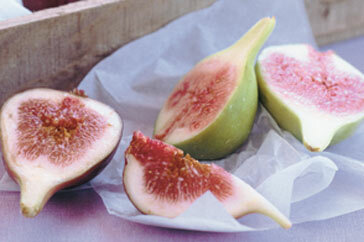 Using a sharp knife, peel off the tough green skin and scrape off most of the pink inside. Cut into squares and steam. I steamed in my pressure cooker for 2-3 minutes on high pressure with natural release. Serve chilled plain or on top of lettuce of bulgur wheat. Also check out my recipe for the easiest pickled melon rind on the web. My version was mild enough for every member of my very white family. Even both my picky kids liked it and asked for seconds and thirds! Look at the end for tips to spice it up and a low-glycemic version. Subscribe (follow, like, join, tweet, share, etc.) any way you want. For full details see original contest post. Worldwide entries accepted! If you're a regular blog reader, you know that many blogs have a weekly Blog Party or Blog Carnival that they run where other bloggers can link recipes or posts that fit the topic. Today I joined "Slightly Indulgent Tuesday" on a blog I just found, Simply Sugar and Gluten-Free. Slightly Indulgent Tuesday is a collection of recipes that are not necessarily Sugar or Gluten Free, but they are in some way healthier than the standard option. I posted "No Sugar Added, Whole Wheat Carrot Zucchini Muffins". There are lots of exciting recipes worth checking out. I'm looking forward to trying "Dairy-Free Chocolate / Carob Almond Fudge (with Sugar-Free option)" on Whole. New. Mom. 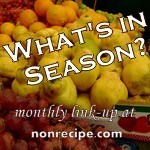 On a related note, I'm planning to start my own monthly Linky on what's is season! This is a great place to share whatever foods you are currently enjoying wherever you live. There will be no recipes required, all food-related pictures, thoughts, and love-notes are welcome. Come back at the beginning of August to link up. If you are not a blogger, or don't have a post to link, send your pictures and stories to nonrecipe@gmail.com and I will include them! (Make sure to include whatever bio info you want me to include.) You can also send me links from the last month on this topic. I have also started reading some new blogs and plan to update my blogroll soon. What are your favorite food-related blogs? What Link Parties do you enjoy? I saw this on one of my favorite crafty blogs, MiniEco. It made me smile. Very clever and artistic. Alexandre DUBOSC is a French atist/photographer/stop action filmmaker in France. You can see more of his work on his website. I hope you will see this as a great technique, not a recipe. Each individual ingredient is optional. What matters is the layering and the size of the raw vegetables. Your goal is to cut the veggies to a size where they will be cooked to your preference exactly when the chicken is done. Optional Layer 0: White rice with water or partially cooked brown rice. If you skip this layer, you will want to serve this with a grain that can soak up all the incredible juices. I served this over medium grain brown rice. Layer 1: Olive oil, fresh green beans, mushrooms, finely chopped garlic, white part of scallions (I use the more mild green part for raw things), shallot, seasoning such as crushed red pepper and ground coriander seeds. Layer 2: Chicken (see why I like dark meat) brushed with tomato paste and seasonings of choice. 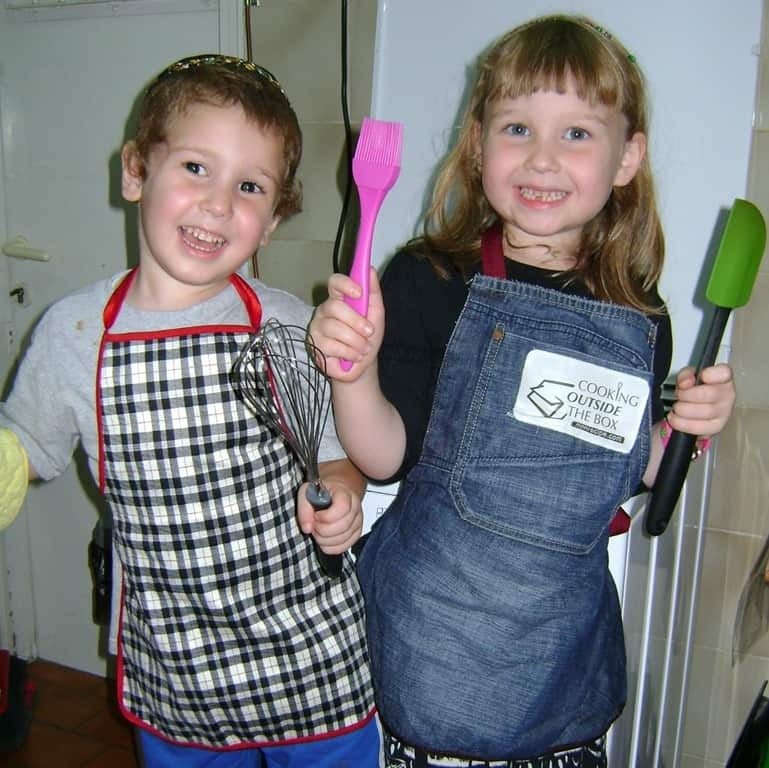 Check out my guest post on CookingManager.com, titled Cooking with Preschoolers: Distraction or Interaction? This was so delicious, I have to share! Very non-restaurant ingredients with restaurant-worthy flavor. I used leftover rigatoni and rewarmed it in my semi-homemade thick, creamy sauce. Add to pan/pot with hot olive oil and sauté briefly. Add a jar/box/can of crushed tomatoes. I used a small carton of very smooth "strained crushed tomatoes." But you can use whatever you have in the house, be it tomato juice, tomato paste, or stewed tomatoes. 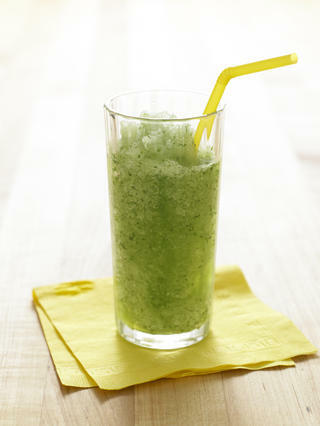 Just play with the consistency by blending or adding additional liquid. Simmer sauce and season to taste. My fresh herbs couldn't take this heat, so I used ground coriander seeds, dry basil, ground red pepper flakes, and salt. I love beets! I got the original recipe through my mom from Marilynn Clark in Florida. This is a great autumn salad, and I love dishes you can mostly prepare long before guests arrive or just keep in the fridge until you get hungry. UPDATE: One of my kids' favorite summer activities is picking grapes from the fridge, putting them in a cup and waiting for them to freeze. (Then they eat them.) Go figure. I also froze half bananas on popsicle sticks and my kids LOVED them. Fruit almost too ripe? Freeze it! Is that too obvious? It's surprising how much my kids enjoy eating frozen bananas and frozen grapes. And now I never have to worry about buying more than we can eat. Besides bananas and grapes, I've frozen strawberries, apricots, watermelon and cherries. I froze the watermelon in silicon muffin trays with a pitted cherry on top. The strawberries I froze in half and quarter pieces spread out in a single layer on a tray. Then I transferred them to a zip-top bag. Going away this summer? Freeze any produce you won't have time to eat. Wash and prep fruits and veggetables so they are ready to eat or cook when you get home. It will be nice to have some healthy food awaiting your return, and the washed and cut veggies will save you time when you are catching up on laundry and work. Bananas and strawberries make great shakes, "ice cream," and ice pops. (I add yogurt and milk for pops.) Ice pops can also be stored in a zip-top bag or container after they are solid. Want to involve your kids? Have them add tiny pieces of frozen fruit (or fresh or canned fruit) to ice pop molds. 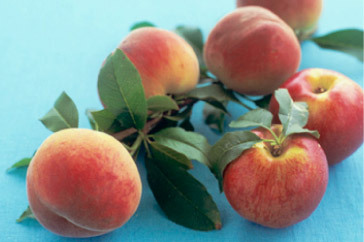 They can make different fruit layers or mix fruit together. Then pour juice or milk over the top and freeze. What else can you put in popsicles? Chocolate, sprinkles, vitamin D drops... ? Also see my post on Adult-Worthy Ice Pops. Are You a Poultry Racist? ﻿﻿Maybe it's just my pregnancy hormones, but I'm been craving dark meat chicken lately. In general, I barely eat meat once a week, but when I do, I want it to taste good! I used to only buy boneless, skinless chicken breast, but this year I started putting taste and simplicity before health (so I thought) and chose whole chicken or legs and thighs, skin on. Now, I keep hearing about the benefits of dark meat, so I thought I'd share with you. Why is dark meat dark? The leg and thigh muscles of a chicken contain more of the protein myoglobin, which plays a key role in oxygen uptake within cells. Myoglobin is high in iron. It is necessary for sustained activity like walking. Birds that fly, like ducks, have this tasty muscle through their chest. Turkey and chicken dark meat has more B vitamins, iron, and zinc than their lighter counterparts, and dark meat is an excellent source of the antioxidant selenium. 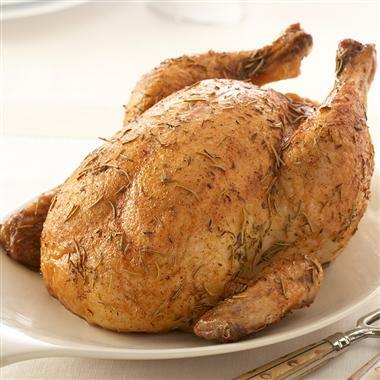 Ounce per ounce, dark meat has more nutritional value than white meat (source link). White meat contains no iron. The fat in dark meat may also aid in the absorption of nutrients in the chicken and your whole meal. My six-year-old daughter had a tonsillectomy this Sunday. My husband stayed in the hospital with her while I came home to hold down the fort. I wanted everything to be perfect for their return, right down to a full selection of sorbet, ice pops and jello. Sunday night after all my cleaning (in honor of my husband's birthday) I went to read the directions to our Osem Gelli mix. The Hebrew was way over my head! I thought it said something about two cups of boiling water, but I didn't know if I needed to add ice or cold water, like Jell-o brand, etc. So I SMS-ed a couple friends and ended up scanning the box. Add two cups boiling water, mix until all powder is dissolved. Store in the fridge. UPDATE: Adele informed me she doesn't like jello! Who doesn't like jello?!? She prefers rice cakes. Quick Tip: If you make a non-lettuce salad with sprouts and parsley, you can dress it ahead with no wilting. My good friend Leor shared this recipe with me. Her pictures are included. She says, "You have to triple/quadruple the dressing for a big salad." Did you know that the recent E. Coli outbreak in Germany was traced to organic bean sprouts (not cucumbers)? 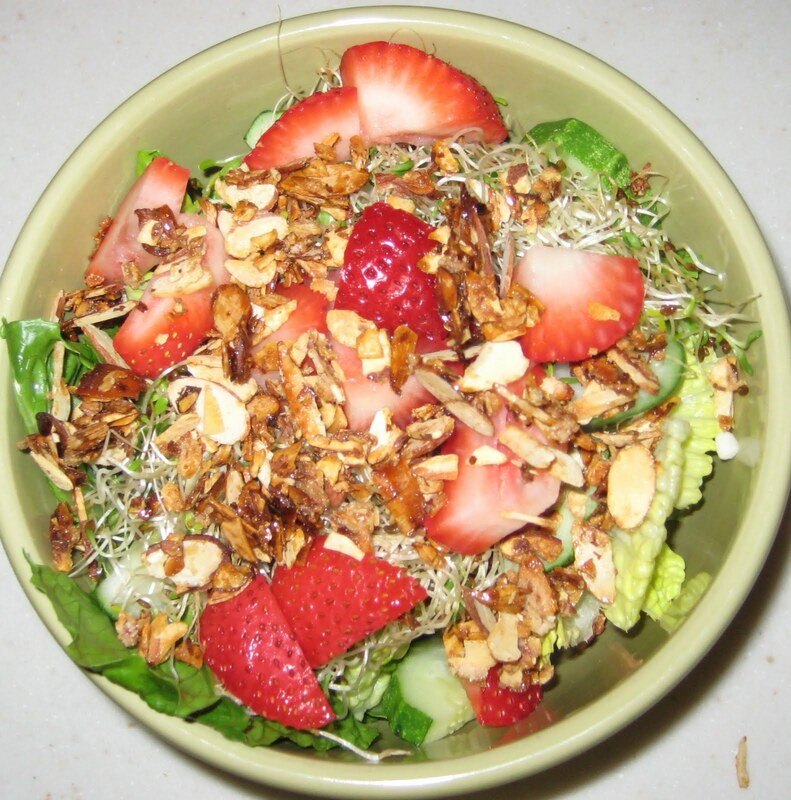 Sprouts have been known to be problematic for harboring food-born illness. If you are worried, grow your own sprouts! It's easy and exciting. Check out my post on growing alfalfa sprouts. Tuesday night we ate at an overpriced Asian restaurant - Sheyan. The atmosphere was lovely. The service was great. Like all the restaurants we saw, they had an English menu. The food was not much better than you could get at a take-out place like Sini Speed for a lot less money. (See my review and take-out tips.) We paid 300 NIS ($88) for two wanton soups, two little cups of hot Saki, and two entrees. There was nothing wrong with the food, it just didn't have the subtle gourmet flavors I would expect from such a restaurant. I did see some very pretty things coming from the kitchen, though. On our last day we worked up an appetite all morning to we could get Belgian Waffles for a late lunch before heading home. We stopped at Katzefet, where we found a nice selection of ice cream, soft serve "bio" frozen yogurt, and an array of shake ingredients. For 25 NIS ($7.30) you get a large Belgian waffle with all the syrup and topping you want, plus whip cream and a scoop of ice cream, any flavor. Food, music, art, and everything in between - what more could you ask for? If you will be in Jerusalem this July, check out the Balabasta Festival, every night in Machne Yehuda Market. You will surely find something to make you smile! Here is a video showing the happenings in the shuk, plus the 'usual' things being sold in the shuk. You may also enjoy my Jerusalem restaurant reviews: Rimon & Gabriela and Sheyan & Katzefet or my photo essay of Shvil Izzim Dairy Restaraunt posted on Facebook. Don't forget to 'Like' Cooking Outside the Box! Thanks to my my brave and generous in-laws, my husband and I are on vacation right now! I'm still reminiscing about our gustatory delights yesterday, so I thought I'd share. For lunch we went to Rimon, which a friend had highly recommended. It has a great location in the Mamilla shopping center with a balcony overlooking Jerusalem city center. The large indoor and outdoor seating was very full on this summer Sunday afternoon, and thank G-d, there was a large outdoor non-smoking area. Unfortunately, the smokers got the best tables along the terrace. The menu was pretty standard for an Israeli dairy cafe. The pesto in my husband's quesadilla was excellent. I would definitely recommend anything with pesto. I am honored to host this month's edition of Kosher Cooking Carnival (KCC), a monthly round-up of kosher cooking ideas and eats. If you're new to Cooking Outside the Box, bruchim habayim, welcome! I hope you'll browse my blog while you're here. 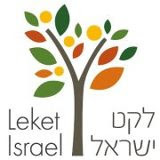 Check out my blogroll for other great food and Jewish blogs. This Shabbat my In-Laws, including my vegetarian sister-in-law came for dinner. I made upside-down stuffed peppers and an avocado dip with cherry tomatoes, cumin, garlic, and some red pepper. I discovered that the cold leftovers are good mixed together! I am also hosting a designer apron giveaway. At Kosher Cooking for Ordinary People, Rivki Locker makes Rhubarb Ginger Muffins (right) and an Onion Tart. At for Your honor, Lizard makes a simple Summer Squash Salad with avocado. I like her instructions in the form of a slide show. For dessert, Lizard makes a delicious looking Berry Rhubarb Pie with a beautiful lattice work crust. Mrs. S. makes her own DIY Vanilla at Our Shiputzim: A Work In Progress.. I like her commentary on olim getting things from the states. My in-laws just brought me Zip Lock bags! Is it so wrong that I fancy myself a genius for cooking the peppers on top of the stuffing? The peppers get more roasted, the rice stays moister, they are easier to stuff, and the half-pepper is a better portion for a side dish. This is really two recipes in one. First I'll tell you about the stuffing, a pilaf which is an excellent balanced food for vegetarians. Then I'll tell you about the stuffed peppers. You can serve the pilaf by itself, or stuff the peppers with waterever mostly-cooked grains you have. Tell your friends, tweet, and post on your blog or Facebook. Comment* claiming your friends when they follow me, or have them comment including your name or blog. One entry per referral. #1 Detail: button neck, chest pocket, patch logo.